Masala Chowk is a new open-air food court in Ram Niwas Garden where you can enjoy the flavors of Jaipur. Masala means spice and chowk means public square or an open area. The word hints at a place with a variety of kiosks serving street food. Initially, it was meant for the tourists since it is close to the popular tourist attraction, Albert Hall Museum in Ram Niwas garden. However, it has become a runaway success among the locals. Masala Chowk brought back memories of Kiran cafe which was very popular among Jaipur residents for years and operated in another part of Ram Niwas Garden. In 1970-80’s, Kiran café was one of the few options for eating out in Jaipur. It was a favorite weekend destination for the families until authorities decided to pull a plug as the millennium approached. Kiran Cafe was extremely popular because of affordable prices and consistent quality. Masala Chowk has become immensely popular among the locals. The reasons for its runaway success is understandable. One, there is no other open-air food court in Jaipur. Two, it offers street food at a single place. Members of a family find it convenient to pick what they like and still eat together. Three, many legendary food outlets from the walled city area or old Jaipur have an outlet in Masala Chowk. Visiting old part of the city is difficult given the chaos, traffic, and parking problems. It is easier to visit Masala Chowk as it is much more accessible. Four, clubbed together all these food outlets offer a huge assortment of street food right from chats, gol-gappas, tea, dosa, samosa and so on. Lastly, the food is affordable and doesn’t pinch pocket. There’s one for everyone. Samrat is well-known for Samosa and Jalebi. Gulabji Chaiwala is famous for its tea. Raman Dosa is famous for Masala Dosa and Uttapam. Caveat- It doesn’t taste like the ones in South India! Prem Prakash Samosa is famous for low spice and low salt yet yummy Samosa. Delhi Chaat and Cafe – Chola Bhatura, Aaloo Tikki & Chola, and Dahi Papdi Chaat. Residents who grew up in 70’s & 80’s fondly recall this place as a circus ground. Many Indian and Russian circus camped here providing affordable entertainment option to the people. In 90’s the concept of circus went away and so did circus. Later an amusement park by the name of wonderland operated for a couple of years. This place has been vacant ever since Wonderland closed down. The Jaipur Development Authority (JDA) continue to call this place “Wonderland Park”. Then and now pictures by JDA depicts the development in progress. From Wonderland Park to Masala Chowk! Masala Chowk is over-crowded during the weekends and traffic jam is rampant. The earmarked car parking lot for the Masala Chowk is only for 20 cars. However, one can find cars parked in vicinity in excess of this capacity. Masala Chowk Parking is a bit of menace as one needs to park their car at Ramniwas Bagh underground parking lot near Ravindra Manch theatre once the dedicated parking lot becomes full. Another car parking lot can be found near Ramniwas Garden entry gate on JLN Marg. This is south gate of Ram Niwas Garden. To reduce the influx of crowd, the JDA authorities decided to charge an entry fee of Rs 10 per person in Masala Chowk. I’m not sure if it has any desirable effect. On a positive note, it is not taxing for the middle class. There is a park area attached to Masala Chowk. JDA, the local authority responsible for implementing this concept has plans to hold various musical and entertainment programs for the public in this park. Masala Chowk Timings – It opens at 9 AM. There is no standard closing time since every outlet follows a different time. Generally, it is open between 9 AM to 10 PM. How to reach Masala Chowk? Masala Chowk is situated in Ram Niwas Garden, near Albert Hall museum. Reach Albert Hall Museum with the help of Google map and then walk in the south direction from its ticket counter, Masala Chowk will be on your left side. One can even walk down to Masala Chowk from Johari Bazaar within 12-18 minutes. Masala Chowk provides an authentic Jaipur experience and is worth a visit. With its central location, the deal only gets sweeter! Your timing needs to be right to enjoy Masala Chowk experience. I recommend visiting Masala Chowk during the daytime or early evenings to avoid the crowd. It is best to combine it with a visit to Albert Hall Museum. Masala Chowk is sure to keep your pocket happy with its affordable food price. Thanks, Fiona. I’m glad you liked it. Do you have something similar in Sweden – outdoor food-courts? The ambience looks cool… an ideal place for weekend hangouts it seems at a reasonable price. Is it new? Don’t remember it being mentioned earlier……. Reminds me of Dilli Haat food section — open air, though food is state wise but thronging with locals and tourists alike. Does Rawat also have an outlet there 😁……. Love their pyaaz kachori a must buy for us if we happen to be in Jaipur. Yes, Monica, this place was recently inaugurated. I haven’t been yo Dili-Haat yet but I guess it sounds something similar. Unfortunately, Masala Chowk doesn’t have Rawat yet. You are right, Rawat Pyaaz Kachori is incredibly popular among locals and tourists. Do you visit Jaipur frequently? nice description with appropriate photos. masala chowk on my list, next time I visit Jaipur. Thank you 😊. Do you keep visiting Jaipur? This year I went for Zee JLF. Hope to go next year. apart from this, sometime if any family member wants. Well, it is still a lot of literature including cinema and societal issues, which are going to be or already part of literary discussion. I liked it. Hope I go there again. Of course, it does have all of that. It’s interesting to hear new perspective and experiences. This year I only visited once. For the rest of sessions, I resorted to YouTube and FB live as it would have been impossible to find a seat in covered halls. True. There were many students. Festival was free for students. There were many great authors and opinion leaders also. Specially session of Nawazuddin and his lady director was jam. Packed. Serving so many delicacies at one place is a huge crowd-puller. I can imagine why it is a hotspot. Good to have come across your blog. I hail from Jaipur so it’s delightful to see the city in its glory. Wow! Happy to hear this, Meha! So where are you based? Do you keep visiting Jaipur? Yup. I do visit.My parents are based there. I’m sure you will love it. Did you visit Jaipur recently? Name, place and the offerings there, are all tempting. A vibrant, tasty, interesting place. Much like the Jaipur itself. Absolutely. Have you ever visited Jaipur? Your’s ia a one stop blog for everything on Jaipur! Another amazing and informative post! Thanks for according me that status, Mayuri. Have you ever been to Jaipur? Ah! Such a yummilicious place it seems… who does not like street food? Above all, the set up is interesting and it is definitely a family place with food of all variety in affordable price. lovely, Jaipur is on my bucket list. Pingback: Dravyavati Bird Park – Jaipur Thru My Lens !! Pingback: Attending Jaipur Literature Fest? 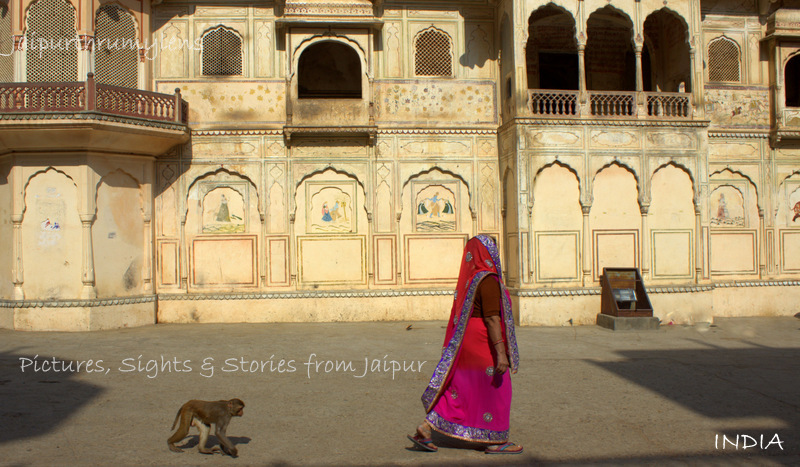 A Quick Jaipur Travel Guide – Jaipur Thru My Lens !! Did you like the place? Previous Previous post: Why Sunrise At Nahargarh Fort Is Not A Good Idea?